Some time in 1982 or 1983, Abdus Salam, a member of the nuclear proliferation ring run by Pakistani scientist A. Q. Khan, leaves Dubai, United Arab Emirates. Salam had been doing business there for some time, using the company Khalid Jassim General Trading (see Before September 1980). According to David Reed, who will later do business with Salam in Florida, Salam departs Dubai after being sued by the local partner in a joint venture, presumably Khalid Jassim. Salam will tell Reed that the partner claimed to a court that he—the partner—had started the business and put up all the money, the court had sided with the local, and Salam had lost all his money and been sent to jail. [Armstrong and Trento, 2007, pp. 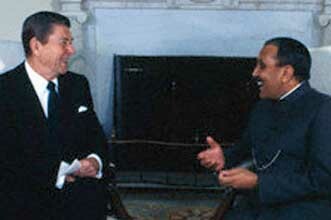 108] Salam arrives in the US around this time (see December 31, 1982). 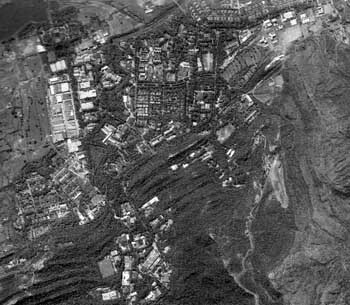 A 2007 satellite image of the Khan Research Laboratories in Kahuta. [Source: GeoEye]Richard Barlow, an analyst working on Pakistan’s nuclear program who was released by the State Department in the early 1980s (see 1981-1982), is hired by the CIA’s Office of Scientific and Weapons Research (OSWR). Barlow re-analyzes the data and confirms his earlier conclusions—that Pakistan is pursuing a covert nuclear weapons program. Barlow learns about the trade in dual-use components—tools and equipment that can be used to make nuclear weapons, but also for other, non-nuclear purposes, meaning trade in them is hard to spot and regulate. One example of this is a California couple that exports dozens of high-speed cathode-ray oscilloscopes and special cameras to Hong Kong, where they are picked up by Pakistani agents. Barlow realizes that such a large number of oscilloscopes must be for nuclear weapons manufacturing, and also finds a link between the purchase and the Pakistan Atomic Energy Commission (PAEC). Barlow will later comment, “There was tons of it and most of it was ending up in [Pakistan]. Pakistan had a vast network of procurers, operating all over the world.” Barlow also finds that the material is going to a secret nuclear facility near Islamabad, the Khan Research Laboratories, where sensors pick up high levels of enriched uranium in the air and in dust on [trucks] leaving the laboratories. [New Yorker, 3/29/1993; Guardian, 10/13/2007] Despite this, in order to prevent Congress from cutting of aid to the anti-Soviet mujaheddin, which flows through Pakistan, US authorities will repeatedly insist Pakistan is not working on a nuclear program (see August 1985-October 1990). Khan Research Laboratories in Kahuta. [Source: CBC] (click image to enlarge)The CIA obtains a complete set of the floor plans for a Pakistani uranium-enrichment plant at Kahuta, 12 miles west of Islamabad, while the plant is under construction. The plans show that the hot, or radioactive, work areas at Kahuta had been built as many as five stories underground, to guard against a surprise Indian bombing raid. [New Yorker, 3/29/1993] The CIA will also obtain detailed information about what happens at the plant when it comes into operation (see (1987)). Pakistan successfully builds a nuclear weapon around this year. 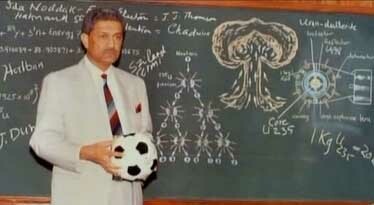 The bomb is built largely thanks to the illegal network run by A. Q. Khan. Pakistan will not actually publicly announce this or test the bomb until 1998 (see May 28, 1998), partly because of a 1985 US law imposing sanctions on Pakistan if it were to develop nuclear weapons (see August 1985-October 1990). [Hersh, 2004, pp. 291] However, Khan will tell a reporter the program has been successful around this time (see March 1987). After a uranium-enrichment facility in Kahuta, Pakistan, becomes operational and starts producing weapons-grade material for Pakistan’s nuclear program, the CIA finds a way to obtain “firsthand information, in detail,” about the work on nuclear weapons there. It is not known how the information is obtained. [New Yorker, 3/29/1993] The CIA previously obtained a complete set of floor plans for the facility (see Mid-1980s). Gordon Oehler, the US national intelligence officer for weapons of mass destruction, begins to track missile deals between Pakistan and China. Pakistan needs missiles from China to use as a delivery mechanism for nuclear warheads it is producing at home. Oehler begins this work shortly after being appointed to the position. He had previously worked in the Office of the Secretary of Defense, as the superior of Richard Barlow, another US intelligence official interested in Pakistan’s nuclear weapons program (see January 1989 and After). [Levy and Scott-Clark, 2007, pp. 257] Oehler’s activities will lead to sanctions against China two years later (see June 1991). Tensions rise in India and Pakistan due to a crisis in Indian-held Kashmir, and the situation escalates to such a degree that strikes with nuclear weapons are considered. In January, Indian police open fire on pro-independence demonstrators in the province, killing fifty, which prompts the Pakistani government to step up support for pro-Pakistani militants operating there. There are also large protests and India blames Pakistan for the unrest, a charge which is partially correct and leads Indian authorities to try to suppress the protesters. India also moves offensive units to the Pakistan border, prompting the Pakistani army to mass on the other side. A US official will later say that the Pakistani military knew it could not hold out against the Indian army using conventional means: “The only way for the Pakistanis to deal with the Indians is to be able to take out New Delhi.… There’s no way that sending ten F-16s with conventional bombs is going to do it. Only the nukes could strike back.” Richard Kerr, a deputy director at the CIA, will later comment: “It was the most dangerous nuclear situation we have ever faced since I’ve been in the US government. It may be as close as we’ve come to a nuclear exchange. It was far more frightening than the Cuban missile crisis.” [New Yorker, 3/29/1993] The crisis is resolved by National Security Council member Robert Gates, who persuades the two sides to disengage (see May 1990). Intelligence from Germany reports that the Pakistanis have designed a nuclear warhead that could be fitted under the wing of an F-16. In addition, the US finds that Pakistan has learned to program the plane’s in-flight computer system to provide the correct flight path for a nuclear-bomb run, and that it has stepped up its F-16 training to practice what seems to be the dropping of a nuclear bomb. The NSA intercepts a call from army chief Mirza Aslam Beg to the Khan Research Laboratories facility in Kahuta authorizing technicians to put together a nuclear device. The US detects high-explosive tests, an essential element of the nuclear weapons triggered process, being conducted near a suspected nuclear storage facility. 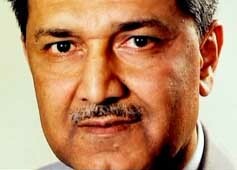 The US finds that the facility has an unusually high degree of security and has also been visited by A. Q. Khan, head of Pakistan’s nuclear weapons program. Satellite and other intelligence produces signs that the weapons are actually being deployed—a truck convoy from the suspected facility to a nearby Air Force base with secure zones similar to those used by the US military when transporting nuclear weapons. China signs the Nuclear Nonproliferation Treaty (see July 1, 1968). At the same time, it signs the Missile Technology Control Regime, a multinational agreement aimed at restricting missile sales. One result is that the US waives sanctions imposed on two Chinese companies the previous year for shipping a nuclear-capable missile to Pakistan (see June 1991). [Levy and Scott-Clark, 2007, pp. 257, 511] However, China will make another missile shipment to Pakistan a few weeks later (see (April 1992)). Fabricated Evidence - Commenting on an earlier version of the Pentagon inspector general’s report, one of Barlow’s former bosses, Gerald Oplinger, said that it contained evidence fabricated by the inspector general’s office. The report alleges that Oplinger deliberately inflated his annual evaluation of Barlow in order to avoid “an unpleasant personnel situation.” However, in a sworn affidavit Oplinger says this charge is “devoid of merit,” and also denies ever having spoken to anyone from the inspector general’s office, even though an interview with him is listed as one of the sources for the report. Pakistan, China, and North Korea sign a formal technical assistance pact regarding some military systems. According to Jane’s Defence Weekly, the pact officially concerns missiles and guidance systems. [Levy and Scott-Clark, 2007, pp. 249, 510] Pakistani Prime Minister Benazir Bhutto had recently visited North Korea to clinch an agreement under which the North Koreans would provide Pakistan with missiles that could carry nuclear warheads deep inside India (see December 29, 1993 and Shortly After), and this visit may have played a role in spurring the pact.